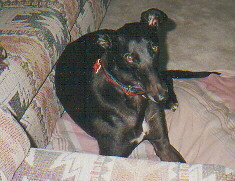 I'm a rescued race dog that adopted Archer & Valerie through the Greyhound Adoption Center in California, when my Mom & Dad co-hosted the morning show on Soft Rock 98.9 in Fresno, CA. Rather than being adopted straight off the track, my personal rescue story is a little different. I turned up tied to a fence at a northern California pound and was scheduled to be put to sleep. If you have a hankie ready, you can read the story of my rescue by clicking here. People mistakenly think that greyhounds are hyper because we're the fastest dogs on Earth, but believe me, we take retirement seriously. I spend 15-20 hours a day sleeping, 'cuz after all, I am a hound. Former racedogs get by just fine with a brisk daily walk. My instinct as a sighthound is to give chase, so Mom & Dad always keep me on a leash or in a fenced area. 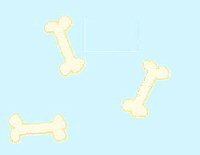 I'm an inside dog, too, 'cuz my breed doesn't have much body fat. But Mom & Dad like me inside, 'cuz we greyhounds don't have that "pungent dog smell" and we shed very little. This picture shows my "special spot" in the family room right between Mom & Dad. 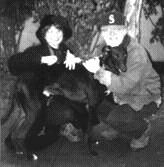 This photo was taken December 21, 1996, when the GAC introduced me to my Mom & Dad. It had been such an exciting day traveling from San Diego! When I got in Mom & Dad's car, I just caressed the toy they gave me and fell asleep. I adopted Mom & Dad after they were interviewed by adoption rep Pam Cafarelli. She also used me for home visits, to show prospective adopters what greyhounds are like. 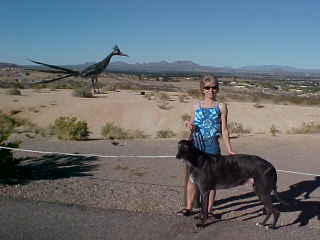 Buddy ignores the giant road runner sculpture in Las Cruces, New Mexico. "It doesn't run, so what's the point?"